Flagship model of GAB; full potential exhibited at circuit. Larger monotube cylinder with 2-way independent ride height adjustment. External canister to cope with extreme heat, stable damping and for cooling efficiency. GAB SS-R, high performance suspension are based on our advance technology and suspension tuning experience, cultivated in racing fields, is now directly applied to street and circuit for creation of this high performance flagship model; Super Special Racing. Top of the line in GAB Suspension's Series, for serious users who strive to run faster than others putting everything on line for one hundred of a second or even for one millisecond, purpose for street or circuit racing. 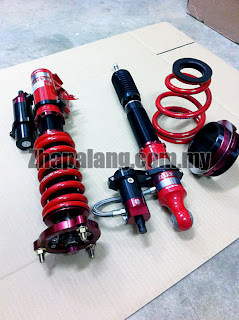 32-Level compression/rebound damping force adjustment, 2 way independent ride height adjustment with external canister & enlarge monotube suspension. High performance chromium alloy coil spring are CNC-wound using the highest quality SAE9254 spring steel and corrosion protected using phosphate and powder coatings. Provided with high kg rated spring delivered best performance for circuit racing where none competitive can compete. Unique design forged aluminium spring seat With multiple gap and keep helping adjust wrench in place for easy ride height adjustment. Specially matched red color bracket, the forefront GAB's color to boost the atrractive under carriage appearance looks. High tensile bracket maximize it's lifetime, withstand lateral forces and ensuring 100% fitment. With R.S.V system, required damping force in high speed range can be well maintained for better stability, minimize body rolls, improving steering response, road tractability and/or traction performance. Enlarge monotube cylinder structure is used to enable very fine control of the machine and aggressive yet detailed communication with the road surface. This also enables to generate linear damping force capturing even the smallest information from road surface, and to maintain stable damping force even after repeated sport drive. As oil and gas chambers are completely separated, aeration hardly occurs and they reduce heat well, achieving superb and stable performance. Use of movable lower bracket allows for separate adjustment of ride height and pre-load, making it possible to secure sufficient stroke and more convenience to change pre-load setting. Allows separate adjustment of ride height & preload for finer setting. Ride height can be adjusted without changing spring preload. For increased oil capacity, in order to generate stale damping force at heavy load usage/circumstances, racing conditions and long distance. This structure enables to secure sufficient oil amount, promotes efficient heat release and excellence well perform at circuit. (rebound adjustment tuning adjust from upper piston rod/compression adjustment tuning adjust canister bottom) Design feature for rebound & compression adjustment set to be separately tune for more precise and wide band of adjustment to meets driver/racer demands. Well established and for optimizing vehicle performance and providing wide band of setting capability specially formulated for circuit or street racing purpose. Equipped with 32-level separate adjustment feature, damping force is controlled at both base valve and piston rod for total of 1024-level(32 comp x 32 rebound) for most finer setting capabilities. Specially designed advance needle valve controls damping force linearly at all level.